Agra fort was constructed in the year 1573 by the great king Akbar, one of the remarkable Mughal emperors in India. The history says that it take about eight years and 4000 eminent workers to built this extremely beautiful palace. Akbar built this palace in the idea of making it his main residence. 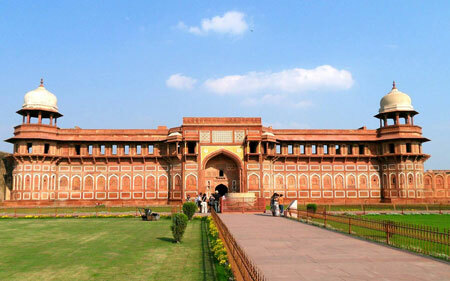 Likewise Agra fort was the prime abode of many Mughal rulers till the year 1638. This fort is a work of brilliant craftsmanship, the significant structures in this fort includes Jahangir Mahal, Khas Mahal, Diwan-i-Khass, Diwan-i-Am, Machchhi Bhawan and Moti Masjid. In later days Mughals shifted their capital from Agra to Delhi, and thus Agra fort was abandoned. Agra fort is just two kilometres away from the world wonder Taj Mahal. Agra fort is also declared as the world heritage site by the UNESCO. This fort has been in the hands of many rulers and underwent numerous renovations. The present structure of the fort was modified by the British during their rule in India. They has also demolished many parts of the fort including some beautiful mosques and halls. This fort is built in the semi-circle form and the base of the fort faces the banks of river Yamuna. The grand fort was protected by double thick fortification of red sand stones. The fortification runs about 2km and is interrupted by beautiful curves and lofty bastions. There are four gates to this fort out of which the Delhi gate and Lahore gate are the most prominent ones. The Mughals emperor Akbar used Delhi gate as his main entrance and also it served as the security gate for the invaders. The gate were built in such a way that they are impossible to intrude. All the palaces and halls found in here are extremely beautiful and intricately designed. The royal pavilions, houses the famous Nagina Masjid and Mina Masjid. The fort comprises of royal baths made out of marbles and highly precious stones. There are private halls for ladies, which are decorated beautifully. Agra fort is a must to visit place in India. Visit it and explore its hidden treasures.